The final payment of the bonds that replace the promissory notes will take place in 2053. THE FIRST PAYMENT on the new Government bonds that are to replace the now-defunct promissory notes will take place in 2038, an Taoiseach Enda Kenny said today. In a speech to the Dáil, he said that the promissory notes, which would have totalled almost €48 billion in lifetime costs, are gone, following the conclusion of discussions with the European Central Bank (ECB). The discussions followed last night’s passing of legislation to put the Irish Bank Resolution Corporation (IBRC) – the former Anglo Irish Bank and Irish Nationwide Bank, which were being wound down – into liquidation. The remnants of Anglo Irish Bank and Irish Nationwide – stains on our international reputations and dents to our national pride – have now been removed from the financial and political landscape. Their closure bookends a tragic chapter in our country’s history. He said that the liquidation of the the IBRC caused the Central Bank to assume full ownership of the €25 billion in promissory notes and other collateral held as security for the funds provided by the Central Bank to the IBRC. The notes will now be exchanged for long-term Irish Government bonds with maturities of up to 40 years. The first principal payment on these bonds will be made in 25 years time, 2038, with the final payment being made in 2053. The average maturity of these bonds will be over 34 years rather than the 7 – 8 years on a promissory note. “In effect, we have replaced a short-term, high interest rate overdraft that had to be paid down quickly through more expensive borrowings, with long-term, cheap, interest-only loans,” said Kenny. The Central Bank will now take ownership of the €3.4 billion bond used to settle the promissory note in March 2012, said Kenny, meaning there will be a €20 billion reduction in the NTMA’s market borrowing requirements in the next decade. The average interest rate on the new bonds will begin at just over 3 per cent, compared with an interest rate of well over 8 per cent on the promissory notes. This will result in a reduction in the State’s General Government deficit of approximately €1 billion per annum over the coming years, which will bring us €1 billion closer to attaining our 3 per cent deficit target by 2015. This means that the expenditure reductions and tax increases will be of the order of €1 billion less to meet the 3 per cent deficit target. This plan will lead to a substantial improvement in the State’s debt position over time, he said. Today’s outcome “is an historic step on the road to economic recovery”, the Taoiseach said, adding it will reduce the burden on Irish taxpayers from the Anglo Irish Bank and Irish Nationwide bailout. Though he described it as “no silver bullet to end all our economic problems”, the Taoiseach said that the plan will improve perceptions of Ireland’s debt sustainability in the eyes of potential investors. Tomorrow we continue our efforts to seek European assistance to recover as much taxpayers’ money as possible from the other financial institutions bailed out by the State. He added that Eurozone leaders, including German Chancellor Angela Merkel and French President Francois Hollande, “have publicly recognised the unique circumstances behind Ireland’s sovereign debt crisis and have mandated the eurogroup to address these issues”. 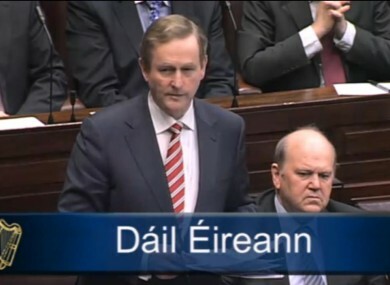 The Taoiseach received a round of applause from the Dáil on the conclusion of his speech. He was followed by Tánaiste Eamon Gilmore, who commended the members of the Dáil who supported the Government in its efforts to strike a deal on the notes, adding that today’s announcement is “another major step on our way back”. Email “Kenny: First payment on new Government bonds in 2038”. Feedback on “Kenny: First payment on new Government bonds in 2038”.